All they want for Christmas is wine! Six years ago, my husband Ronn came home with four tons of Zinfandel in tow. Not your typical husband-to-wife gift, but one that changed the direction of our lives dramatically. While the Lubenko family (Ronn’s side) has been in the wine industry since many of the original vineyards were planted in the foothills in the mid-to-late 1800s, I (pictured above with our winemaker Mo) grew up on a cattle ranch; granted, that cattle ranch is now the site of one of Amador County’s newest wineries. Still, I didn’t begin my work with wine until 2002 when I became the Executive Director of the Amador Vintners Association. During my 10-year stint there, I watched as the association grew from nearly two dozen wineries to 40 participating wineries. But, actually makingwine was still out of my realm at the time. Before leaping feet first into the wine world, I had a career in broadcast. After a stint in Palm Springs, something drew me back to my roots in Amador County, where I ended up working for a local radio and TV station for a while, as well as doing public relations for Sutter Health before joining the ranks of Amador Vintners. Let’s just say promoting wine was a bit more fun than writing press releases about infusion centers. Of course, it helped having a husband who grew up tending one of the historic Zin vineyards, but it was that initial gift of Zin that got the wheels turning. For so many years I had been telling people about the awesome wines of Amador. Finally, I thought, What better time to join them? It was that and my constant bitching about Plymouth’s need for revitalization, i.e. downtown businesses, that convinced me it was high time to get in the game. Opening Prospect Cellars in the old post office building was essentially me putting my money where my mouth was. Not only did I have a boatload of grapes in my hot little hands, but I’m part of a family that does not shy away from getting involved, digging deeper. Did I mention my dad is the mayor of Plymouth? If you’ve been in the tasting room, you’ve surely run into him; he’s fondly known as “Grandpa John.” Dad has served either on the city council or the Amador County Board of Supervisors for as long as I can remember, as his father before him did. Needless to say, being all in when it comes to community is in my blood. Of course, the Prospect Cellars story of winemaking would not be complete without an excellent winemaker. Enter Moises “Mo” Acevedo. Mo started out as the assistant to our original winemaker, but in 2013 our head winemaker at the time said, “Jamie, let’s just make Mo the winemaker; he does all the work anyway.” That was that. He may not be some super slick, UC Davis grad, which is typical in the industry, but he is a winemaker who earned his way up the ladder by working hard. He’s a great person, and I’m a fan of promoting and holding up good people. And, that’s where we are today. Mo makes the wine and is supported by our team of talented and knowledgeable women in the tasting room and deli, like Macy and Toni. We look forward to seeing you in our little town and sharing more of our story and history with you, as well as our delicious wines, of course! 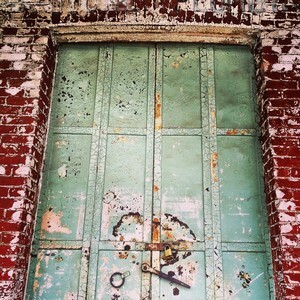 *Stay tuned for a winemaker profile coming soon: Getting to know Mo. I joked at the dinner that half the fun of having Chef Carolyn Kumpe of Vendage and Company cook for us is watching the controlled chaos (i.e. lighting things on fire). But, I am happy to report there were no open flames at our first Farmers Market Dinner of the season. Instead, as usual, Carolyn spoiled us with her delectable farm-to-table fixings. 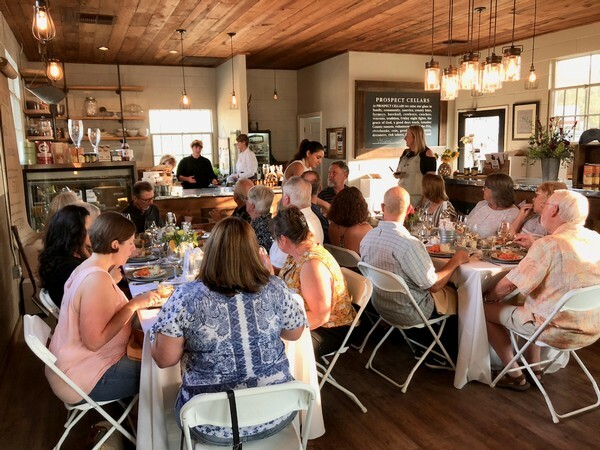 My Prospect Cellars crew and I welcomed 24 guests for our first Farmers Market Dinner of the season last Thursday. Normally, we would brave the heat and take a jaunt down to the farmers market ourselves, but with the smoke and extreme heat, we decided to move indoors and enjoy the ambiance of our historical tasting room (once the old post office). 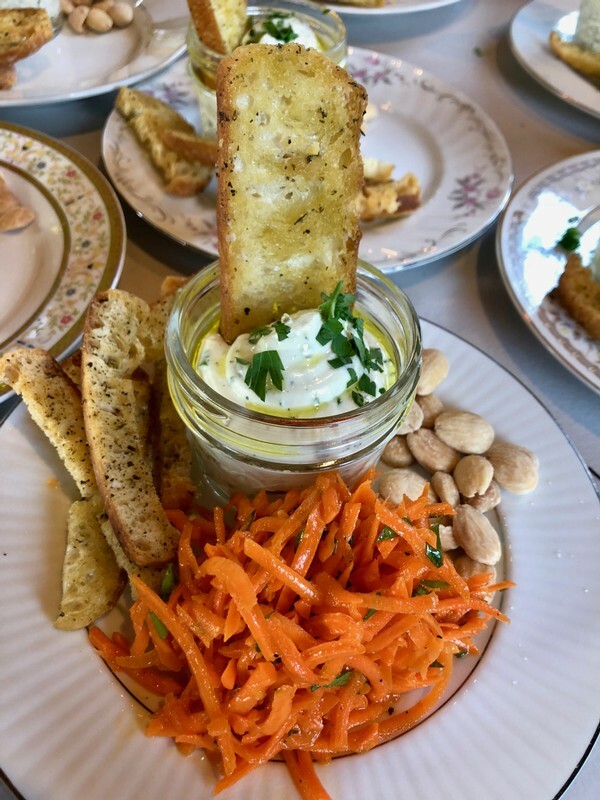 Carolyn started the evening with a homemade Potted Goat Cheese, Crostini and Almonds paired with Carrot Slaw and our Quick Silver Sauvignon Blanc for the first course. 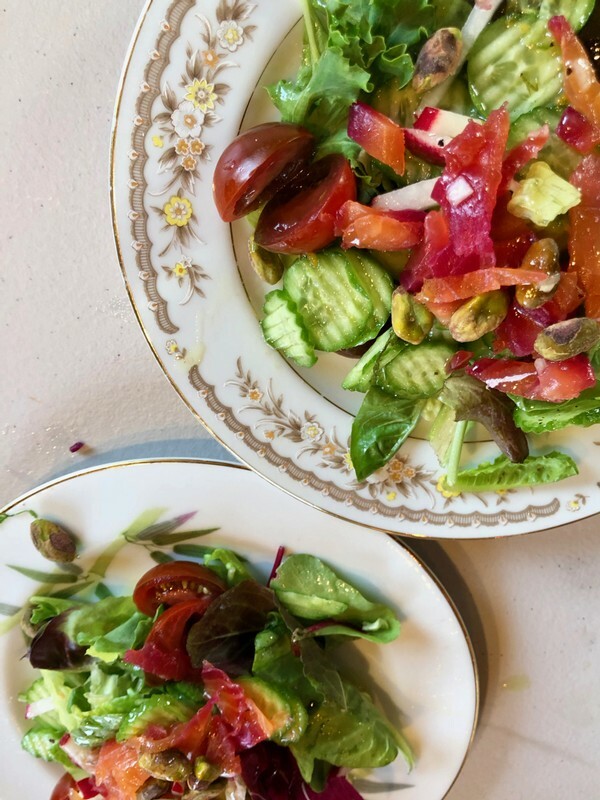 We moved on to Mixed Greens with Beet-Cured Salmon (beets are good for liver health, you know!) Rarely have I seen that many bright, natural colors all on one plate; plus, it paired perfectly with our crisp Riverbank Rosé. 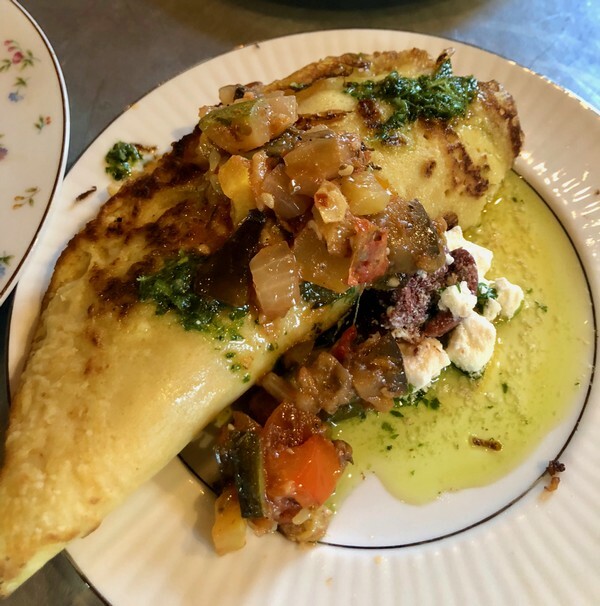 Next up, we enjoyed a surprise dish of socca, which is a Provencal-style crepe made with chickpea flour; Carolyn topped it with ratatouille (recipe below) made with fresh vegetables from the farmers market taking place a block away. We paired this French delight with our colorful and cutting Pick & Shovel Petite Sirah. 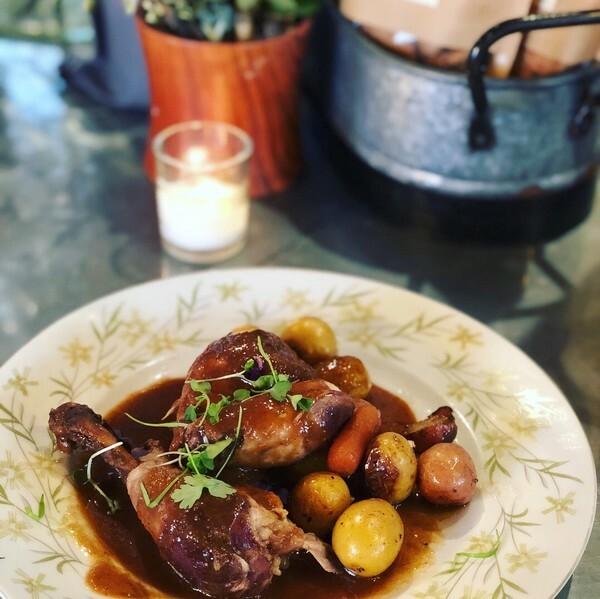 Finally, we arrived at the main dish: Chicken Braised in Barbera with Fig and Thyme, which was paired with our Cooper Ranch Barbera, an obvious choice. 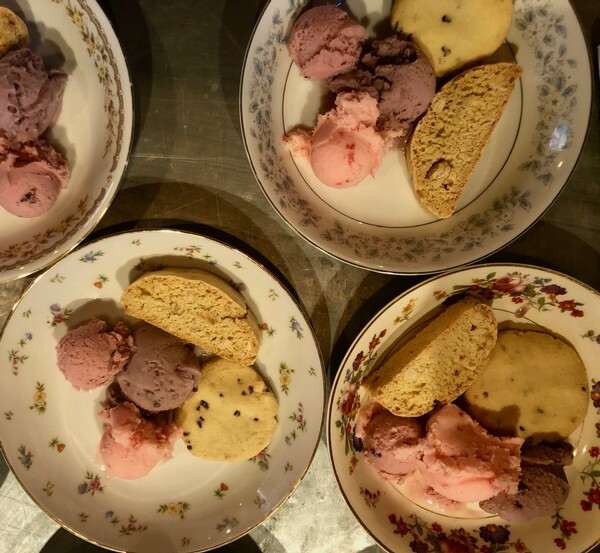 We finished the evening with a sweet treat—our Prospect Cellars wine-infused ice cream made by Gunther’s in Sacramento and Carolyn’s scrumptious shortbread cookies. Heat 3 tablespoons of oil in a large nonstick pan over medium heat. Add the eggplant and season with 1/4 teaspoon salt. Cook, stirring frequently, until soft and starting to brown, 10 to 12 minutes. Transfer to a plate and set aside. Add another tablespoon of oil to the pan (no need to clean it). Add the zucchini and cook, stirring frequently, until tender-crisp, 3 to 4 minutes. Season with 1/4 teaspoon salt and transfer to a plate; set aside. Add two more tablespoons of oil to the pan and add the onion and bell pepper. Cook, stirring frequently, for about 5 minutes. Add the garlic and continue cooking for about 3 minutes more. Do not brown. Add the tomatoes and their juices, tomato paste, thyme, sugar, crushed red pepper flakes (if using) and 3/4 teaspoon salt. Cook, stirring occasionally, until the tomatoes are broken down into a sauce, 8 to 10 minutes. Add the cooked eggplant to the pan; bring to a gentle boil, then reduce the heat to low, and simmer, uncovered, for about 10 minutes or until the eggplant is soft. Add the zucchini and cook for 1 to 2 minutes more, or until just warmed through. Taste and adjust seasoning, if necessary. Sprinkle with fresh basil and thyme, drizzle with a little olive oil if desired, and serve warm or chilled. Leftovers can be stored in the refrigerator in an airtight container for up to 5 days or frozen for up to 3 months (although keep in mind that the zucchini won't stay crisp after being frozen). This year we celebrate 80 years of the Amador County Fair. It goes without saying that we at Prospect Cellars are highly involved in the fair festivities. Aside from having a display window and a son in the rodeo circuit, we will also be pouring our wines at the fair. With that said, we thought it would be helpful to put together a comprehensive wine and fair food pairing menu for your deep-fried, yet refined, taste buds. I know what you’re thinking: Beer and corn dogs. Well my friend, you’re wrong. It’s all about Barbera and corn dogs. That’s where it’s at. The acidity of this Italian varietal and Amador County sweetheart cuts right through that thick corny crust and adds a layer of sophistication to an otherwise lowly mash of meat parts—our pal, the hot dog. Life is sweet with this perfect fair pairing. Forget chocolate and port. Enter Muscat and funnel cake. The hint of orange in our Fool’s Gold Muscat adds character and bright fruit to the powdery goodness that is our deep-fried friend, the funnel cake. If you are a woman who grew up in the country like me, chances are your husband’s favorite food of all time is actually quite simple: Gas station chicken strips. Well, these are next level gas station chicken strips—these are county fair chicken strips! Paired with our Gold Digger Red Blend, this is the ultimate workin’ man’s meal. From rodeo circuit rider to grape grower, this pairing will please all. Ladies, don’t be shy; the duo is an all-around crowd pleaser. You’ve got to have a wine with guts and grit to belly up to a steak sandwich. Our Paydirt Zin has both of those things, plus a dash of black pepper on the palate, and who doesn’t like a nice, peppery steak? For something more tannic, try our Pick & Shovel Petite Sirah, which can stand up to any protein profile, but has a gift for muscling against many a marbled red meat. Our Sauvignon Blanc can take on any Granny Smith, but the acidity stops that thick layer of caramel dead in its tracks. This is the perfect combination of sweet and tart that will quench your thirst on those hot fair days, but also satisfy your county fair sweet tooth. 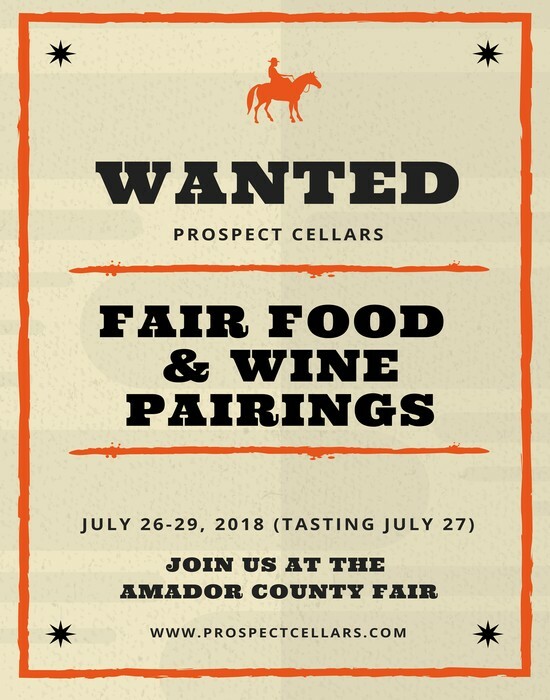 Join us and 40 other Amador County wineries from 7 to 9 p.m. on July 27 for a fair wine tasting. Visit the Amador County Fair website to purchase tickets. When you make a pie, you combine different varietals of apples that showcase complimentary characteristics. You might mix a Granny Smith with a Golden Delicious to balance out your pie and provide the perfect marriage of sweet and tart. I joked with our winemaker Moises “Mo” Acevedo that if he would just apply himself, he could make some excellent apple pies. But, we’ll let him stick to doing what he does best—making mouth-watering wines. 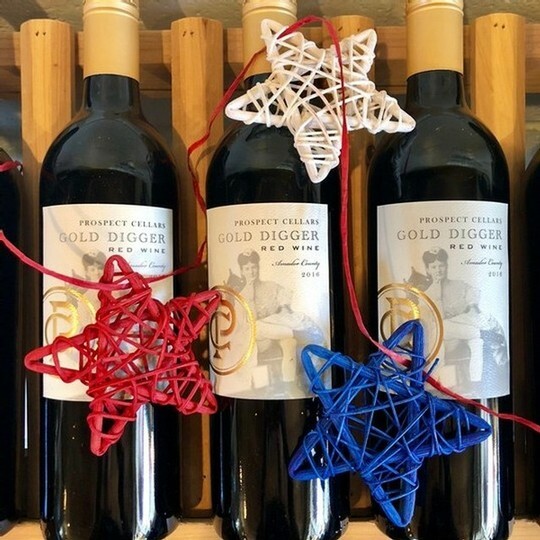 Sticking with what we know and do well is something we pride ourselves in at Prospect Cellars; it’s precisely the reason we don’t make a Cabernet Sauvignon or a Pinot Noir. Neither of the varietals fare well in the Amador County heat, and we know it. “Napa has the best Cabs in the world. It’s no competition,” Mo says. Most people across the country would agree. 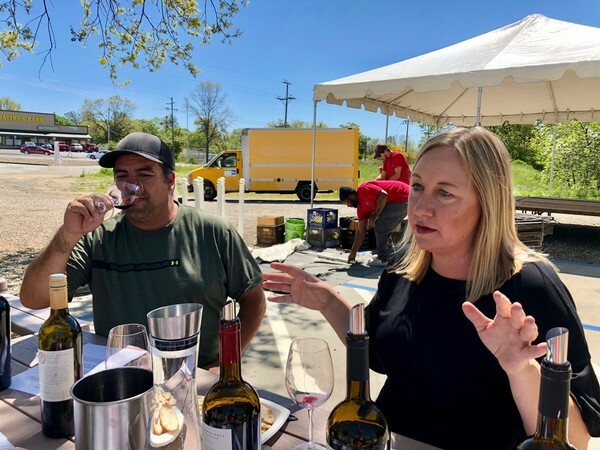 Instead, we feature varietals such as Barbera, Amador County’s darling, and Zinfandel, the grape that pays the bills and provides a sturdy foundation for the rest of the varietals to stand on. Our sole blend, the Gold Digger Blend is a beautifully balanced bouquet (see, I told you there was more alliteration) of 35 percent Barbera, 30 percent Zinfandel, 15 percent Sangiovese and the rest Petite Sirah. Mo’s tasting notes describe it as “multi layered with all sorts of the goodies you’d expect from each of the varietals involved,” goodies ranging from blue fruit to leather. This “broad-shouldered” beast of a blend pairs well with almost any hearty dish. Think pot roast or meatloaf, but since it’s summer, a prime T-bone on the barbie will do just fine. 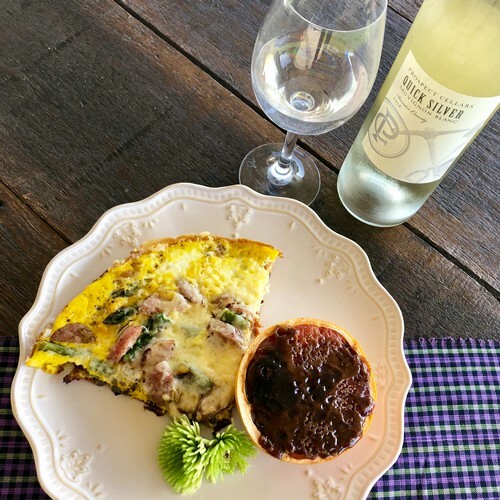 I have come to realize that most of a winemaker’s talent comes out in their blends, and that’s easy to see, or taste rather, with our Gold Digger’s Blend. Blends are the fun part—for us to drink and Mo to make! Blends are where Mo feels like he can shine the most. “This is my pie,” Mo said. So, we hope you will enjoy a bit of our liquid “pie” this 4th of July, but most of all, we hope you will take the time to appreciate our freedoms as Americans. And, let’s just be thankful the Brits were taxing us on tea instead of wine—or we might still have funny accents and take afternoon tea and biscuits. The famed Original Grandpère Vineyard actually started with a grand-mère, specifically my husband’s great-great grand-mère (French for grandmother) Mahala Teter Upton. With the help of her 8-year-old son, Rueben, Mahala planted the Original Grandpère Vineyard in 1869 after the sudden death of her husband John. Mahala and her 11 children waded through Prohibition by selling the grapes to Midwest home winemakers and finally sold the vineyard itself in 1930 to the Steiner family. The property remains under matriarchal domain today with Teri Harvey running the grounds as head harvester. Though the vineyard is no longer in our family, it will always have roots in our history and our winery. Here we are six generations later, as the women—mother’s and now my own daughter— continue to plow the way for our family. 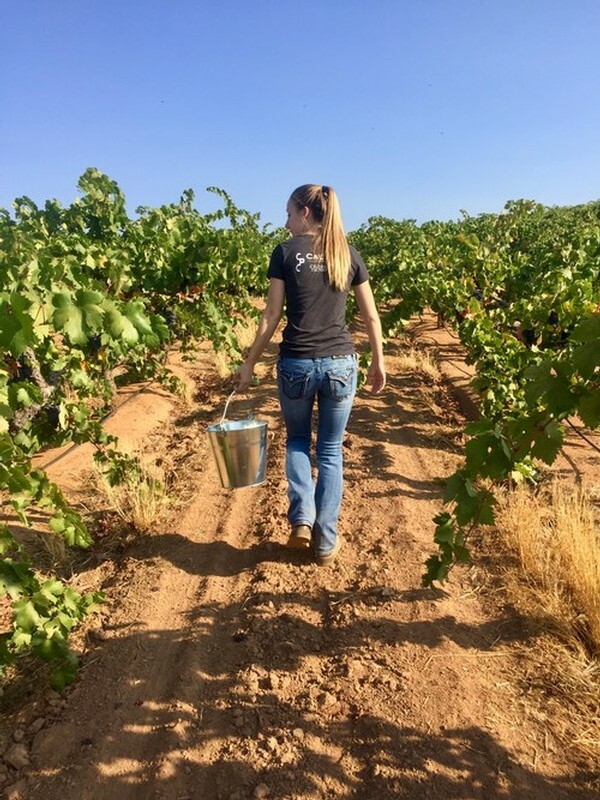 On this Mother’s Day, I survey our tasting room on Main with pride and think about my own daughter, Bailey, who will graduate in June from Cal Poly (pictured above); she’s the first women in our family to get a college degree in agriculture. Today we raise our glasses to family, community, America, county fairs, farmers, baseball, cowboys, coaches, veterans, tradition, Friday night lights, the grace of God, a good day’s work, Amador County sunsets, volunteers, 4H and the FFA, riverbanks, rain, good dance partners, dreamers, risk takers, PROSPECTORS, but most of all MOTHERS! Let’s not only raise our glasses, but let’s also brunch with our amazing mother, because who doesn’t love a good reason to brunch? 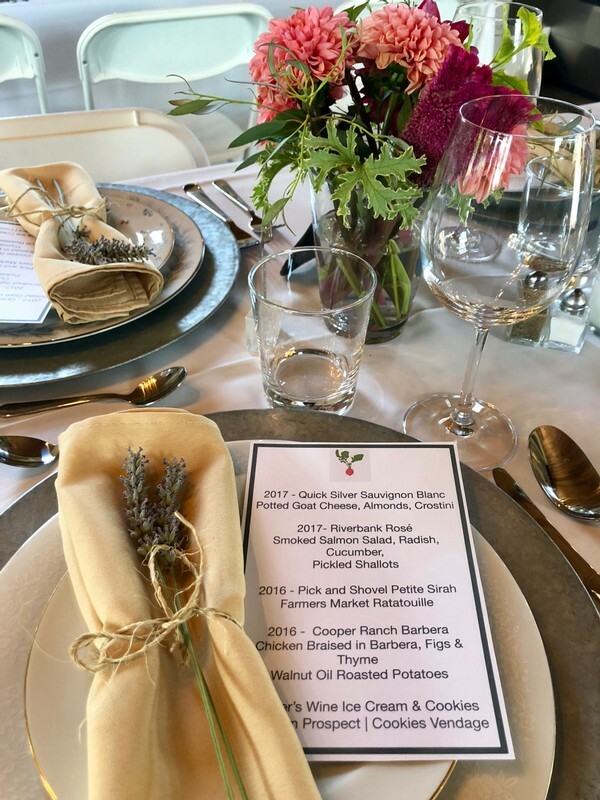 Below is the perfect sweet and savory menu paired with our fabulous Prospect Cellars wine. Enjoy! Directions: Sweat onions in olive oil and garlic powder in a large fry pan. Break up asparagus and add to the cooking onions. Let the veggies cook on medium heat for a couple minutes as you beat the eggs and add the salt and pepper to your eggs. Add your precooked sausage to the veggies then add in your eggs. Let the bottom firm up for a few minutes on medium heat then grate cheese on top. Turn oven to broil and broil your frittata on high for four minutes or until the egg on top has cooked and the cheese has melted. Wah-la! *Estero Gold, made by the Valley Ford Cheese Company, is sold at Prospect Cellars. **A great addition is broiled brown sugar grapefruit, which also pairs nicely with our Quick Silver Sauvignon Blanc. Sprinkle a tablespoon of brown sugar on half of a grapefruit and broil on high for a couple of minutes, or until the sugar has crisped up like crème brûlée.